Liquid Smoke, that was my first thought when I had my first sip of Islay Ales successor to the Worts n'Ale. A good six months after my last Islay Ales new beer tasting I finally tried another new beer. Again this is a collaboration between Islay Ales Brewery and Bruichladdich distillery on Islay. Similar to the Worts n'Ale this is strong stuff again. Not so much in the alcohol content, but more in the taste. It comes in at 6.3% ABV compared to the 9.0% of the Worts n'Ale. Obviously still fairly strong, but almost a third less. The taste? As I said, my first thought was ‘liquid smoke’. You can certainly taste the peat smoke in this beer. Not as sweet as the Worts n'Ale was. A more bitter taste, I think, probably from the peat. More suited to a cold winter than to the summer, as we finally have it. But then it only became available after the Islay Festival. 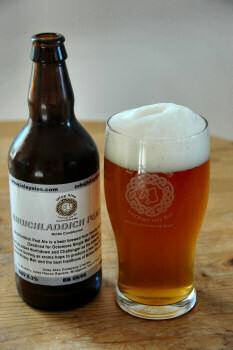 Bruichladdich Peat Ale is a beer brewed from heavily peated barley (Destined for Octomore Single Malt Whisky). Islay Ales has added Northdown and Challenger as the bittering hops and Amarillo, Bramling Cross and Golding as aroma hops to produce a beer that has all the character of a Peated Whisky Malt and the best traditions of British Ale all in one bottle.